It is 10 PM in Greece at the time of writing this first blog. 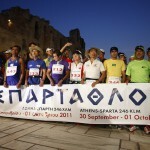 My thoughts are with all the runners of Spartathlon. In few hours they will greet their second dawn on the road from Acropolis to the feet of King Leonidas. I wish them all the best on this demanding and inspiring trek.